Contrary to what some may try to tell you, there are really three basic types of grasses; SmartGrass ‘Leisure’, SmartGrass ‘Sport’ & SmartGrass ‘Civil’. At SmartGrass we don’t want to confuse our clients. All landscaping areas; childcare; schools; etc. Used by Councils and the AFL for sporting surfaces. Simulates "Kentucky Blue Grass or Thin Bladed Grasses"
Perfect for Council open space areas; roundabouts; naturestrips; etc. Warranty: 7 Year limited warranty. 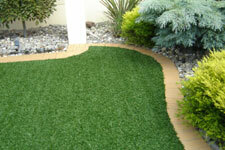 Care for your SmartGrass properly and you can extend its life expectancy. Service from your contractor is optional but recommended. However, you can perform easy, regular, general grooming maintenance to improve the aesthetic appeal and functionality of your SmartGrass for the length of its life. Simply rake over the surface with a plastic leaf rake (NOT METAL) or leaf blower to remove the build up of leaves and debris. Recommended infill level should be approximately 20-30mm. This will give you a fantastic lush green, well stabilised surface. The life of your SmartGrass may be shortened due to lack of grooming and incorrect levels of infill. • Plastic leaf rake – once a month, rake over SmartGrass to remove leaves and debris. • Every 3-6 months, professional grooming of your lawn by one of our installers. 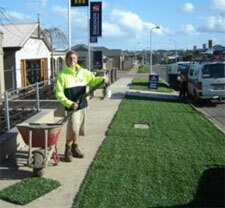 REMEMBER – Good maintenance extends the life of your SmartGrass– Exceeding Expectations.